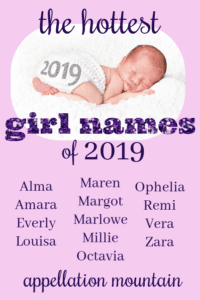 The new year is here, so let’s talk about the hottest girl names 2019! No fair listing Olivia or Evelyn. We know the Top Ten names already have parents’ hearts. And maybe there’s no good reason to include names far outside of the Top 1000, either. Sure, some of them always catch on – and I’ll update my annual Trendwatch posts soon – but they’re not the hottest, either. At least not yet. No, these are the names everyone is considering now. They weren’t on our radar just a few short years ago, but today? We know at least one little Everly or Octavia, or maybe we’d consider those names for a daughter due in 2019. 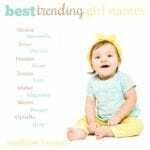 From the oh-so-modern to the vintage revivals, there’s something this list sure to appeal to every parent. Simple, sweet, and vintage, Alma follows the success of names like Cora and Luna – and, of course, Emma, too. It first caught on during the Crimean War, when girls were given the name to celebrate British victory in the Battle of the Alma. One of the reasons it’s so hot now? It coincides with the Spanish word for soul. Read more about Alma here. 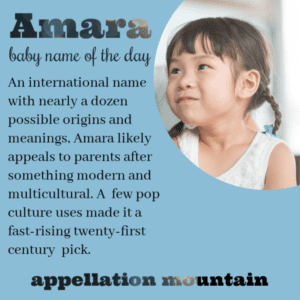 Amara spans the globe, with origins in multiple languages and appealing meanings galore. It can derive from words meaning grace, beloved, or immortal – appealing options, all. Characters from the X-Men, Supernatural and The Vampire Diaries have answered to Amara. If Amara didn’t exist, it’s easy to imagine parents inventing this one. Read more about Amara here. 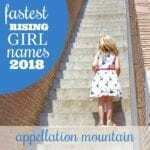 With appealing word ‘ever’ and the ‘v’ sound baked in, Everly picks up on lots of three-syllable, ends-in-y names for girls, from Dorothy to Kimberly to Tiffany to recent favorite, Avery. Despite being unknown a decade ago, it already feels like a staple of this generation. As a surname, it has deep roots, and reminds us of the Rock and Roll Hall of Fame-inducted The Everly Brothers. Anthony Kiedis used it for a son in 2007, but it’s always been more common for girls. Everlee and Everleigh rank in the girls’ Top 1000, too. We love a long, traditional feminine name. Think of Alexandra and Isabella, names that carry a hint of the romantic – and a whole lot of strength, too. Louisa fits this category perfectly, plus offers the literary association of Little Women author Louisa May Alcott. 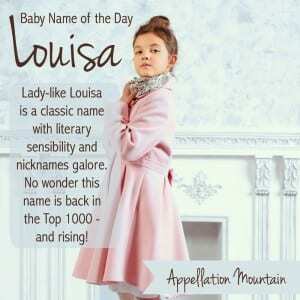 With names like Lucy and Luna in the Top 100, no surprise this Lou- name is rising fast. Tailored Maren lands just on the right side of feminine – it can be considered a form of Mary. It’s a nature name, too, with ties to the Latin marinus – of the sea. 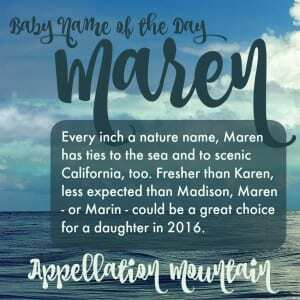 Country singer Maren Morris took this name from obscurity to the mainstream,. This makes it a great compromise choice, likely to appeal to fans of Harper and Evelyn alike. 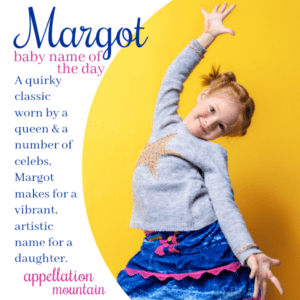 A traditional French nickname for Marguerite, Margot has long read as quirky and artistic, just slightly outside of the mainstream. But today, with that vibrant ‘o’ ending, Margot seems more like a name that bridges the modern and traditional with style. It’s also spelled Margo, hold the ‘t’, but for now, the ‘t’ spelling is four times as popular. Marlowe naturally follows Madison and Harper, Willow, Harlow and Margot. Celebrities have used the name, along with retro Marlo. We do love a good o-ender, for girls and boys alike. Virtually unheard of just a decade ago, Marlowe feels like the kind of cool girl name that could zip right up the popularity charts. Read more about Marlowe here. Take Molly and Lily, add a dash of Ellie, and you’ll find Millie. Sure, it might be short for Millicent – or even Mildred! – but in our age of Sadie, Millie stands on its own. It feels sparky and lady-like. As the Julie Andrews roaring 20s rom-com title puts it, she’s Thoroughly Modern Millie. I’ve yet to write about Millie, but check back and I’ll update when I do. For ages, Octavia appeared on lists of alternatives to Olivia. But it took a post-apocalyptic television series – along with a fierce female lead – to take this name into the mainstream. The 100’s Octavia got her name from the ancient Roman one. Oscar-winning actor Octavia Spencer deserves some credit for the name’s resurgence, too. 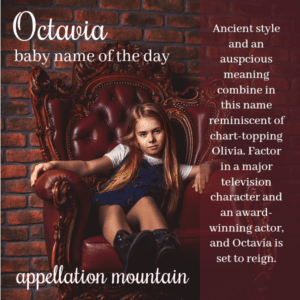 Read more about Octavia here. Another Olivia substitute, Shakespearean Ophelia was long neglected. But that’s slowly changed, helped along with by pop culture uses, from Pan’s Labyrinth to the Lumineers song. It shares sounds with Olivia, but also the chart-topping Sophia and fast-rising Amelia. That’s a recipe for one of the hottest girl names. We met Remy the culinary rat in 2007’s Ratatouille. This unlikely source of inspiration boosted the name for boys and girls alike. Remington caught on, too, thanks to growing interest in weapons-inspired names. Both remain more popular for boys. But Remi seems to be accepted as the most popular feminine form, a mini name that’s more big on style and sound. I’ve yet to write about Remi, but you can read about Remy here. Another in the key of Emma, vintage Vera benefits from two things: first, that sharp V sound. Second, it boasts two appealing meanings – faith, in Russian, as well as the Latin word meaning true. Style icon Vera Wang lends the name some luster. With Ava in the US Top Ten, it’s easy to imagine Vera catching on quickly. Read more about Vera here. We love a good Z name, from Zoe to Zuri. But Zara feels a little different. There’s a member of the British royal family by the name, and because it’s close to Sarah, it feels a little more traditional than, say, Zazie or Zinnia. But it has an appealing globe-spanning quality, a name both exotic and accessible. Read more about Zara here. Those are my thirteen picks for names that we’ll hear much more of in the coming year. 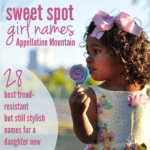 What do you think the hottest girl names 2019 will be? Would you consider any of these for a daughter? 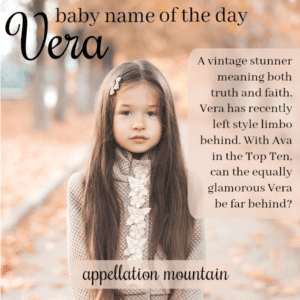 We named our daughter Vera Rosalyn last year. My husband and I love the name, but we have had to deal with some hurtful comments saying we gave her an “old lady name.” All I can hope is that my Vera likes her as much as we do! I think the Amara link is broken, I just get page not found. It does suit her through – it means both Grace and bitter… which is her to a T!!! Louisa and Millie are my favorites. I know a little Millie, and it’s just adorable on a little girl! I love Louisa and Amara! I have heard the gorgeous Louisa used a bit more lately here in England.